Good morning! 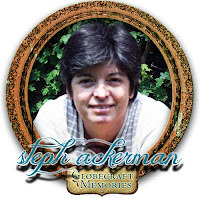 Steph here with a Globecraft & Piccolo Ornament. Think how fun these will look hanging on the tree this year They are very easy to make and each one will be different depending on the techniques used. It's never too early to begin creating Christmas decor. These ornaments are double globed; meaning they have globes on both sides, so the image inside can be seen from all angles. However, for this project, I decided to paint the inside of one globe with blue paint to provide a backdrop for the image. For a touch of color, I ran a black ink pad lightly across the painted globe. When using Enamel Powders make sure to coat the pieces and heat set prior to assembly so the domes are not damaged. The bottom oval rings are coated with Vintage Copper and the top ring was done with Girls Night Out. The crib is done in Vintage Copper, the angel with Mermaid Tears. 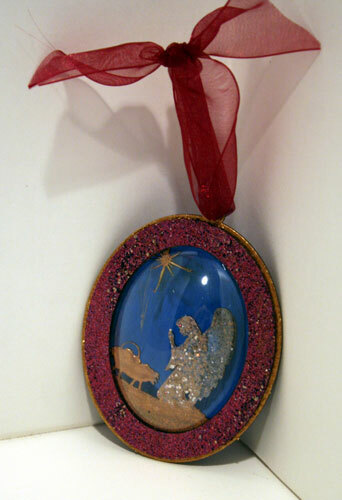 The angel's wings feature Temple Stone and the star is finished off with 24K Gold. Once completed, I adhered all layers to the globes, then added a wide sheer ribbon to the top of the globe so you could hang it. This ornament is light weight and can easily be hung on a Christmas tree branch without issue. Thanks for stopping by today. Visit my blog to see another project using Globecraft & Piccolo. Love that Girl's Night Out on the outer ring of the ornament! Very cute! I'm a big fan too! I'm making 12 ornaments as Christmas gifts. I LOVE the process of making them!